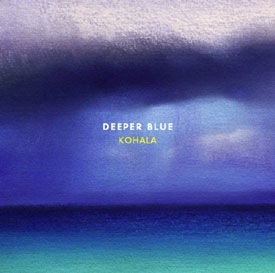 DEEPER BLUE shows Kohala’s evolution while influences of folk, jazz, and life in Hawaii continue to serve as a foundation and musical inspiration for the three members of this Big Island acoustic guitar trio: GRAMMY Award-winning Charles Michael Brotman, Charlie Recaido, and Rupert Tripp, Jr. Since the release of their last album, “Cool Breeze”, lead guitarist Brotman has won the first GRAMMY Award ever given for Hawaiian music (Best Hawaiian Music Album). Brotman produced the GRAMMY Award-winning CD “Slack key Guitar Volume 2″, and both he and Recaido performed on the CD, which debuted at number one on Billboard’s world Music Chart. As the trio evolves, their structure stays basically the same. Brotman plays the melody line on nylon strings in his classical-style, and Recaido and Tripp create a unique chordal texture with their exquisite finger-style acoustic guitar playing on steel strings. The combination of the trio’s diverse musical infl uences establishes their own distinct sound—an acoustic blend of contemporary hawaiian, folk and jazz.